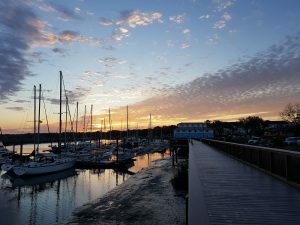 In January 2019, Mia Overton of Marina Dock Age published an article that focused on Lady’s Island Marina in Beaufort, SC. Steven Ekovich, the National Managing Director, sold Lady’s Island Marina to Tom Daniels after determining that he was the best buyer for the property. 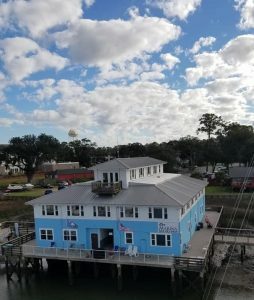 Tom Daniels embarked on a new career and a cross-country move when he bought the Lady’s Island Marina in Beaufort, South Carolina. Daniels, who says he doesn’t even own a boat, bought the 76-slip marina in October 2018 and moved his family from Southern California to the East Coast. 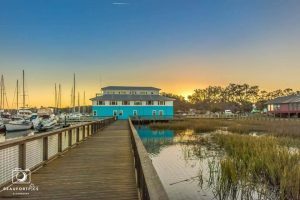 The marina is located on Factory Creek, a half-mile from the Intercoastal Waterway and one mile from downtown Beaufort, which Southern Living magazine ranked as the #1 Best Small Town in the South in 2017. “Living in Beaufort has been fantastic,” Daniels said. He enjoys the small-town atmosphere where people invite you into their homes, you see people you know while walking downtown or sitting at a stoplight, and his son goes to a school with 250 children enrolled. And, running the marina? “It’s like living in a ‘Cheers’ episode every day,” he said, noting the many returning families who come to the marina. He hired International Waterfront Consultantsto walk him through the process. He and consultant Chris Goshow toured marinas in California, so he could get familiar with how a marina works and the needs of boaters. He flew to Beaufort a couple of times to learn about the condition of the property. Steven Ekovich, national managing director of the Leisure Investment Properties Groupof Marcus & Millichap, listed Lady’s Island Marina for an investment fund in Houston. Ekovich said he had three buyers, but after speaking with Daniels determined he would be the best fit for marina, the community and the seller. Lady’s Island Marina is a good example of creating a destination for boaters. The 3-acre property includes Dockside, a popular waterfront restaurant. Daniels and the restaurant owners plan to expand the restaurant and add a second restaurant/bar on the property. He said the city is also interested in future development and beautification of the marina, as it is one of the city’s popular attractions for residents and visitors. The Boathouse houses the dockmaster’s office, a boaters’ lounge, shower facilities, and leased office and commercial space. Two of the popular tenants in the Boathouse are Journey Marine Canvas, a boat canvas/sail repair company, and One Yoga Sanctuary, which offers yoga and massages. The marina store sells sundries, sandwiches and snacks, and local art work. They also offer a loaner car that boaters can use when they come ashore. Ekovich said one of the unique features on the property is a 2,500-square-foot workshop. “It is the only free boater’s workshop space we have ever seen where boaters can go during the winter and work on boat projects. Boaters return year in and year out for that amenity.” He also noted the marina’s location in a protected cove, which is especially beneficial during hurricane season in the South. Daniels paid $3 million for the marina, which has about 82 percent occupancy with 32 wet slip rentals, six owner dockominium slips, and 44 dockominium slips from which the marina receives management fees. About 40 percent of the revenue comes from slip rental, 40 percent from net income from the restaurant, and 20 percent from office rental income. Daniels plans to convert one of the Boathouse units to provide overnight lodging for boaters who need a place to stay while working on their boats. He purchased an additional four lots abutting the marina that will be used for future development.